Why was the Mozarabic rite banished? What happened in the Iberian peninsula to deserve it? I am sorry for not posting as often as I should. I have survived to a hectic semester which included more papers than I want to think about, a couple of articles, the LMS dissertation/article and the new website of PIMS (last two a work in progress), all while applying for grants and expanding my readings towards new avenues of research I have always wanted to explore. Also, I have in mind several main changes on this blog that I still need to think over and want to make during the summer, what had made me consider to stop writing and first reorganize or not. But, whatever is going on should not be an excuse. Thanks for your feedback these last months. There is a topic that has been bothering me around for a bit and about which I have been thinking in writing, not only as an exercise to consolidate knowledge but as a way to emphasize how much still needs to be done to contextualise Visigothic script. 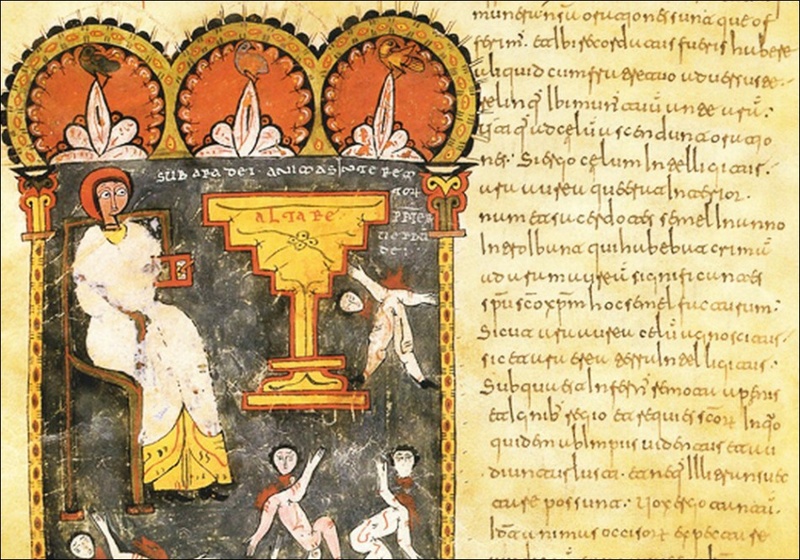 We can debate if the problem is the lack of studies about the script and its sources – what I believe is true – or an absence of open minds and capacity of thinking pursuing a different path of thought when reading the studies published on topics that have to do with Visigothic stuff. I could have chosen among several topics for which this short intro is valid, but the specific one that bothers me this season is liturgy: the Mozarabic rite. What exactly is the Mozarabic rite and why they were so eager to change it. Why have I been thinking about that since what I do is Visigothic script? As I have mentioned in my latest posts, one of the aspects which contributed to the gradual intensification of Caroline minuscule influence, and the subsequent disappearance of Visigothic script and adoption of Caroline script in the Iberian Peninsula, was the change of rite, from Mozarabic to Romano-Gallican. Why this contributed, you may be wondering… Before the change of rites: the more or less mandatory imposition of the new Roman rite, the sooner-to-be best-seller – of course written in Caroline minuscule – with it was already circulating all along the Iberian Visigothic territories, becoming a must-read for every monk/scribe who, from avidly reading Caroline minuscule, should have incorporated some features to his script. After the change of rites: because all the codices in the newrite were copied (although that was not completely true) in the new script, making therefore the change of writing systems required. That summarising how important for an early medieval palaeographer is to understand the change. 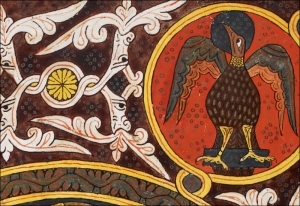 In the series of posts I foresee, this one the first, I will be blogging about everything I will be reading on the topic, at least what I consider more revealing, starting by answering the following: Why the Visigothic liturgy was seen as some dangerous way of thought that needed to be abolished? What could have happened in the Iberian Peninsula as to ‘deserve’ it? I had never considered it before, but it seems it was Elipando’s fault. © Madrid, Biblioteca Nacional, Ms. Vit. 14.2. Beato’s reply to Elipando, the Commentaries. Elipando was archbishop of the see of Toledo between 717 and c. 800, a bishop with a very subversive ideas: he proposed that Jesus, in his divine nature, was the son of God, but as to his human nature, he was only his adopted son. That is, he was the one who, with Félix of Urgell, was spreading heretic ideas that needed to be eradicated throughout the Iberian Peninsula. The topic of the Adoptionism quarrel before the 8th century is interesting enough – with all that influence from Nestorianism and Islam – as to write more about it, but I am sure you can just Google it to satisfy your inner erudite. Within Spain, the remarkably famous now Beato de Liébana (yep, the scribe who wrote the beautiful, peaceful and enjoyable reading that it is his Commentary on the Apocalypse) and bishop Eterio of Osma throw up their hands in despair. One could discuss here the possible political interest that Beato might have had in crushing the relationship with the central church, being a monk from Liébana, in the middle of the Astur kingdom. Also the fact that a no-so-famous back then monk was openly going against the main see of the Christian Iberian Peninsula – Elipando must have gone mad (letter to abbot Fidel). Or even the interest that can be guessed in Elipando and Felix’s ideas for “making friends” with their new southern neighbors counteracting the influence of the powerful Carolingian church. Abroad, the also prominent Alcuin had, of course, something to say (Adversus Elipandum). But going to the facts, it seems that the ‘problem’ was that Elipando did not have a better idea than to support his arguments with sources, quoting texts as any good scholar today will use footnotes. 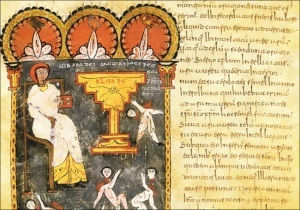 He summoned the authority of some of his Toletan predecessors (Eugenio, Ildefonso and Julián among others), bolstered his position by citing portions of prayers of the Visigothic liturgy. That made Charlemagne, the bishops and priests of the kingdom of the Franks, of Italy, and of Aquitaine, feel a bit uncomfortable with the crazy ideas these Spaniards were developing as can be read in the Synod of Frankfurt decrees (794): “this heresy should be eradicated from the Holy Church” (cap. Francf., 165). A reminder about why to care: Félix was bishop of Urgell, in the Spanish March, under Charlemagne. In the decrees of the Synod of Frankfurt, they did not say “we eradicate it” as well as, as always happens with decrees, even if they had, to implement the purge was something that could not possibly have been done from one day to the next. However, one of the main aims of the Carolingian religious reforms was to establish the Roman Liturgy to be followed in the realm of Charlemagne, as well as to spread it in all the other lands under Carolingian influence. Both the condemnation of Adoptionism, and indirectly of the Visigothic liturgy, and the Carolingian supranational religious movements were the cause of the change. * I am indebted to the excellent articles written by R. Reynolds compiled on the book ‘Studies on Medieval Liturgical and Legal Manuscripts from Spain and Southern Italy’ I came across them some months ago. Please DO check it if you have the chance. Very interesting post! I am not specially versed on C8th, but two ideas come to my mind. 1) There was not a single mozarabic tradition. Diferent parts of the peninsula had different backgrounds/developments. 2) The ‘political’ side is so deeply intermixed that cannot be ignored, ie: if my memory serves me well, Elipand made explicit connexions betwwen Beautus and franks. Again, it seems to me that different backgrounds / interests were goin on, a monotonic view probably will fail to understand the complexity of the moment…? Thanks Joan! I’m also not particularly specialized in these kind of theological problems but I really enjoy reading and writing about them. Thinking in the whole myriad of approaches that one can develop as for the context in analysing them. Do you know of any publication dealing with these different ‘mozarabisms’ that you mentioned? It will be amazing to study how much they differ and why. As for political sides, I must confess that working as a paleographer I didn’t think about them before as much as I’m doing these last months. Maybe I’m going through a phase of seeing politics everywhere, but really, they seem to have so much to do with the script and its changes! Much more than I have read at least (aka, the synods). I agree, there’s no place for monotonic views! Well, it shoud be prouved that there was an unified visigothic rite, first (I really like to know about any modern work on this topic). ? I am not a paleographer, so there are other references about documentary transmissions (mostly on hagiography related works) that I didn’t try to follow (ie from: Yarza Urquiola, Valeriano : 2006 : “La Vita vel Gesta Sancti Ildefonsi de P.S. Eladio – estudio , edición crítica y traducción” : Veleia – revista de prehistoria, historia antigua, arqueología y filología clásicas : 23 p.279-325 or Fàbrega i Grau, Àngel : 1958 : “Santa Eulalia de Barcelona – revisión de un problema histórico”, etc,etc) that probably could be of your interest? Moltes gràcies Joan! Ara ja puc dir tranquil·lament que tinc una llarga llista de lectura pendent per a l’estiu!